ETHIOPIA IS A LANDLOCKED nation located in northeastern Africa in an area known as the HORN OF AFRICA. While containing large stretches of plains in the east and south, the country is dominated by highlands, which rise to well over 3,000 ft (1,300 m), and the Great Rift Valley, which is several hundred meters below sea level. Elevated plateaus compose much of the geography in northeastern Africa, an area close to the RED SEA, which encompasses both ERITREA and ETHIOPIA. 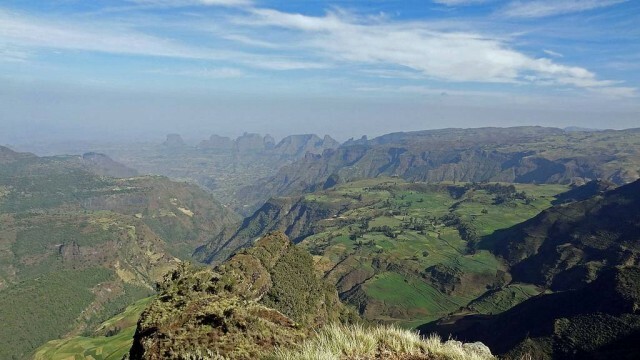 Likewise, the Great Rift, formed 50 million years ago by volcanic activity, also extends across most of eastern Africa and bisects Ethiopia’s central mountainous plateau from roughly the southwest to the northeast, creating two highland areas. The largest, the western side, is known as the Ethiopian Plateau and is the higher of the two, with the tallest peak, Ras Dashan at 15,158 ft (4,620 m). Located in the Simen Mountains, the peak is located southwest to two similar, though slightly less imposing mountains. Aside from being among Africa’s highest mountains, the area is also the source of the Blue Nile, Lake Tana. Land on the eastern plateau slopes in a generally westerly direction and provides much of Sudan, and ultimately the NILE, with water. The smaller, eastern plateau extends toward the Gulf of Aden, on the INDIAN OCEAN, and divides the lowlands to the east, near Somaliland, from the Danakil Desert by the Eritrean border. The verticals of both plateaus are very impressive. In the center, the Great Rift rises at almost a vertical to both heights. The eastern spur, however, is generally more gradual than the Ethiopian plateau in the west and slopes into the surrounding desert. Water erosion has created impressive cuts throughout the highland; vertical drops of many thousands of feet are common. In addition, the same erosion has created smaller plateaus, knows as ambas, which are the sites of many of the nation’s important battles and monasteries. The highlands obviously have influenced Ethiopia’s climate, demographics, and history. Despite being so close to the equator, Ethiopia has a quite moderate climate largely because of its heights. Outside of the Danakil depression, the Great Rift Valley floor, and the eastern plains, which are primarily desert, Ethiopia’s climate varies from alpine, in the higher mountains, to moderate. The capital city, Addis Ababa is located at 8,000 ft (2,450 m), with average yearly temperatures of 68 degrees F (20 degrees C). Winter, which can be very brutal in some higher areas, lasts from October to February. Spring is generally drier, though some rains do occur. The heaviest rains fall in the summer months, from June to mid-September, and taper off in the autumn months. Given the relative heights and sloping of the highlands, and the amount of water it receives, there are numerous lakes and rivers. Most of the forests are in the southwest, while the plateau highlands contain scattered copses and GRASSLANDS. Fauna in the highlands are mainly domestic animals, such as cattle, which graze on the grasslands, and birds, large cats, hyenas, and wolves. Early human habitation started out in the Rift Valley, with the oldest human ancestor being found there in 1974. Over time, habitation expanded to the highlands, providing people with rich soil and grazing space for their animals. One of the first Ethiopian civilizations arose in the northwest plateau, at Aksum. Over time, the highlands, including portions of northern and northwestern Eritrea, were incorporated into various Ethiopian Christian kingdoms, often at war with the Muslims in the eastern lowlands. The highlands protected Ethiopia from many foreign invasions, particularly from the Italian colony of Eritrea in 1896. At the Battle of Adowa, fought in the highlands just south of the Eritrean border, the Imperial Army of Ethiopia destroyed an Italian-led Eritrea force. The highlands, however, were unable to completely protect against the Italian invasion of 1935.